The paperclip - an essential item for any office anywhere in the world, usually found hiding in drawers, pen holders, everywhere.... But, there's more to these little pieces of wire than meets the eye. Ten facts worth of things, in fact. And here they are. Prepare to find out ten things you possibly didn't know about paperclips! A paperclip is a piece of steel wire which has been bent into the shape of two almost-complete loops. Pieces of paper can be inserted between the loops and held together. Ingenious! The design of the paperclip familiar today has never been patented. It is not known for sure who invented it or where it was invented. What is known was that paper clips with the same design were in production in Britain in the 1870s where it was made by the Gem Manufacturing Company Ltd, which suggests - but doesn't prove - that they may have been invented there. The Gem paperclip, as it became known, was introduced to America in 1892. It went on to become the most common paperclip in use all over the world. 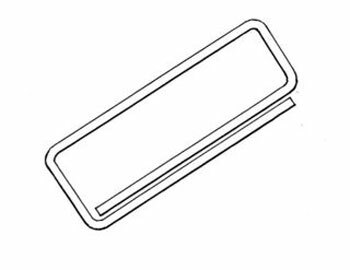 The first patent for the design of a clip that could hold paper together was granted to Samuel B. Fay in the United States in 1867. His invention was actually intended to hold tickets to fabric, and although it could also be used as a clip for paper, it is very different from the paper clip used today. He is therefore NOT the inventor of the paperclip. It was also widely believed that the paperclip was invented in Norway and a giant paperclip stands outside a business college in Oslo to mark this fact! Johan Vaaler, an inventor, designed a paperclip in 1899 which was patented in Germany and the USA in 1901. However his design, pictured to the left, was impractical and was never put into production. Even so, Vaaler later became credited as the inventor of the paperclip when his patent was discovered sometime in the 1920s by a Norweigan engineer working in Germany. He documented his findings, not realising that Vaaler's paperclip was different to the "Gem" style one in common use, and the information that the paperclip was a Norweigan invention found its way into dictionaries and encylopedias in the years following the Second World War, despite being inaccurate! The Swedish word for a paper clip is "gem". During the Second World War, wearing a paperclip could have got you into serious trouble. The people living in countries under Nazi German occupation were forbidden from wearing badges or pins depicting national symbols. 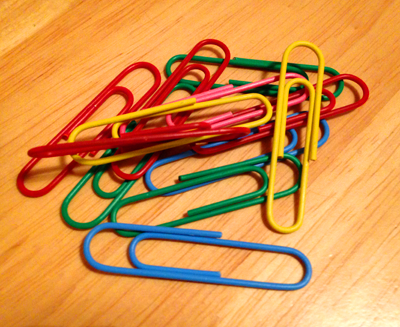 The paperclip, a seemingly meaningless piece of stationery, became used as a symbol of unity due to the fact that it is used for binding things together. Wearing paperclips became banned once the Germans cottoned on to the reasons for them being worn. After the war, it was believed that Norweigans wore paper clips during the war as a sign of national pride because it was a Norweigan invention. In fact, the information that the paper clip was a Norweigan invention, although incorrect, wasn't even widely known during the war. People just wore paper clips to symbolise unity and solidarity. The paperclip is widely used as the symbol for an attachment in most email services. Clippy was an animated paperclip that used to appear in Microsoft Office products to offer help. He made his first appearance in Office 97 and last appearance in Office 2003. He was most famous for tapping the inside of the monitor when he appeared and regularly saying "It looks like you're writing a letter." Oh, the memories! Operation Paperclip was an American operation to fly German scientists out of Germany and over to the USA after the Second World War. The Americans wanted to make use of the scientific and engineering intellect and expertise of the Germans, and to ensure that they didn't fall into the hands of the Soviet Union. One of them, Wernher von Braun, was a rocket scientist who would assist the Americans with developing the rockets that would eventually take people to the Moon. Von Braun also worked on ideas for manned missions to Mars.